Anna is an English teacher and an occasional freelance journalist; she has self-published two previous books, been a volunteer nationally and internationally and now writes poetry, as well as working on a new novel and some short stories. What is 20 - 7 ? Delighted to have been recommended this book. Beautifully written. loved this book, it really spoke to me. This is a wonderful novel, hard-hitting and heart-warming in equal measure. Its protagonist, Alison, creates an alter-ego, Hapless Ally, in response to the trauma of a difficult childhood, that she believes to be more palatable than herself. However, Hapless begins to take on a life of her own. Anna Vaught's writing is stunning and she has a great gift of voicing her characters - Alison has a host of famous imaginary friends: Albert Camus, Shirley Bassey and the fossil-hunter, Mary Anning, to name a few - who are brought vividly to life. 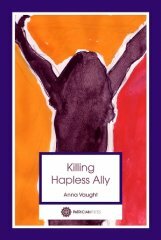 This book is deeply moving, tackling the issue of mental health, but is also ultimately uplifting and, at times, laugh-out-loud funny - Anna Vaught brings a lightness of touch to a difficult subject with her superb black humour. I would thoroughly recommend this debut novel. A book to make you laugh and make you cry and give you a whole new perspective on what life can be like for other people.